This was my first attempted birthday cake. It is just 2 8-inch cakes covered in pink icing which I colored myself. It is cheaper than buying it ready done. 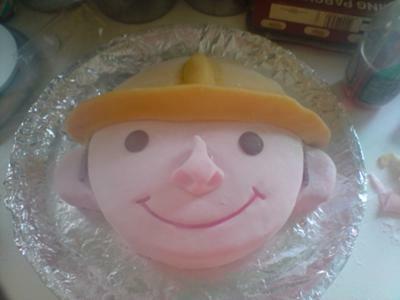 I made the hat out of marzipan. I used sweet shoe laces for the mouth, pink icing for the nose and chocolate buttons for the eyes. I used fizzy cola sticks for the hair. Spectacular! (I'm not so sure about this being your first attempt, though.) A really wonder rendition.